Our mantra on those stressful days that everyone, regardless of career field, has is “Bees and Trees.” It helps remind us that the time is approaching when our schedule will be governed more by the seasons and sunsets and less by bells and deadlines. However, today “Bees ‘n Trees” refers to bees IN trees. 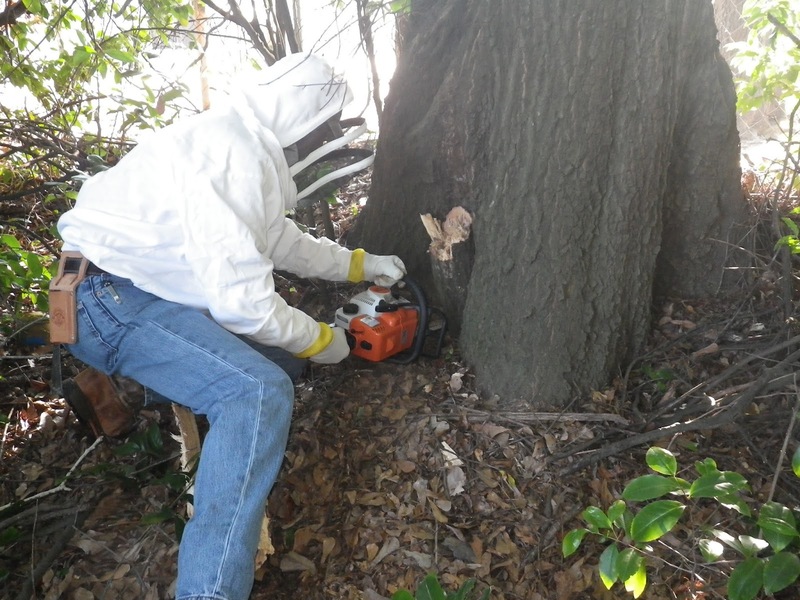 We were asked to try to save a hive inside a hollowed out tree that had been struck by lightening years ago. Pest control companies have exterminated colonies a few times in the past, but bees keep finding this fantastic place to live and moving back in again. Two trees have actually merged at the base and it is at this split that the bees were entering. We couldn’t see inside the split because another tree had grown up, leaving just enough room for bees to enter. After removing that tree and widening the hole a little, we were able to take the above picture of the beautiful comb hanging down from somewhere…. Hubby widened the hole again, and we could see and reach more. 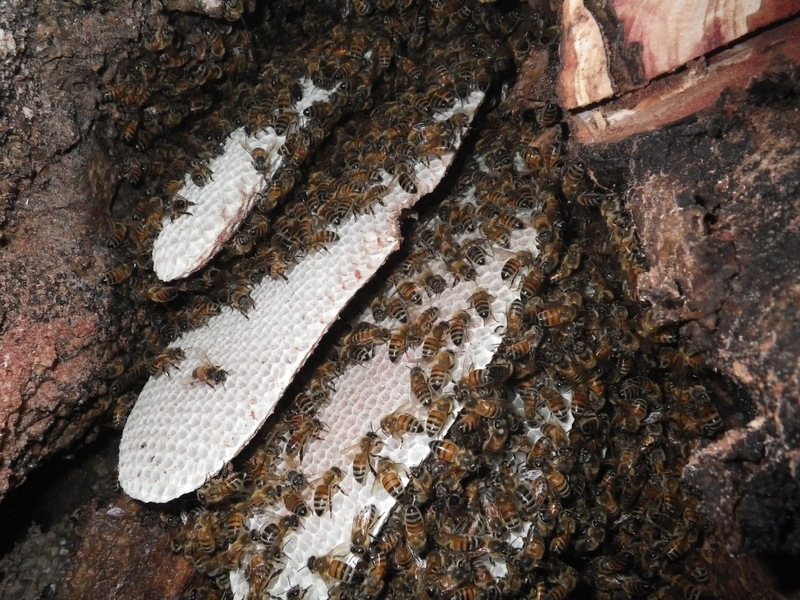 The hollow part of the tree — and the hive — extends into at least two chambers with somewhat rotten wood between them. At this point, bees were exiting from a variety of small holes around the tree — some of which were at waist height. We have no idea how far up the tree this hive extends. He pulled out some of the most beautiful comb I have seen. Still, even after cutting as much as we felt was safe, we were unable to reach any comb with brood, although we did gather enough comb with empty cells or honey to fill two large and two medium frames. We put those frames in a Nuc and left it at the hive entrance in hopes of attracting, and thereby saving, some of the bees. 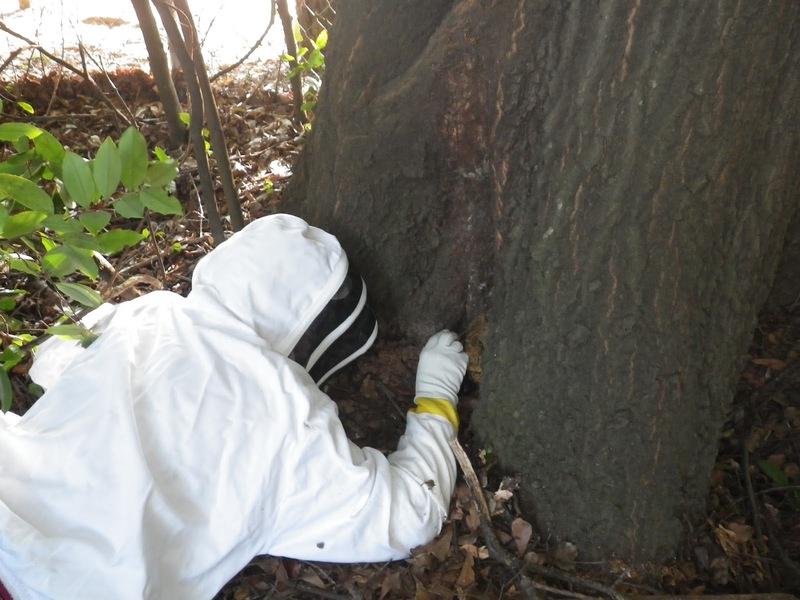 As the tree is split and each side has a wide crown, it’s just not possible for us to safely retrieve these bees. The property owner may opt to have the trees cut down by an arborist. If that is the route she takes, we will try to save the bees at that time. It is such a friendly and productive hive; we would hate to see such good genetic stock removed from the gene pool (never mind that we simply like the critters!). But they are in town close to a playground, and no-one wants to see children stung.